In a small group towards the end of my Equipping for Ministry residential week, when we had been sharing very deeply and supportively together, the avowedly non-theist in the group said as we finished: ‘We have just shared a taste of the Kingdom of God’. ‘The Kingdom of God is Here and Now.’ The first words I remember hearing from Thich Nhat Hanh on a retreat he led at the University of Nottingham in 2010. At that point I knew that this was a Buddhist group I could belong in. ‘And he said to them, “I tell you the truth, some who are standing here will not taste death before they see the kingdom of God come with power.” Mark 9:1. Invited to share my hopes for the future at the conclusion of a weekend looking at our spiritual gifts, I say ‘to bring the Kingdom of God to Watford’. I’ve also found myself saying in ministry that ‘the Kingdom of God is here, now, but it doesn’t look much like it because most people don’t realise it’. So what do I understand the ‘Kingdom of God’ to mean? There are some clues in my previous posts about God and Heaven. I would use ‘Heaven’ and ‘Kingdom of God’ interchangeably. ‘Kingdom of God’ suggests very strongly that God is in charge, that it’s a theocracy. It describes the way we aim to run Quaker meetings. Modern re-writes such as ‘Divine Republic’ just don’t quite work for me, though I do understand people’s discomfort with the connotations of ‘Kingdom’ – sexist, elitist, etc. Another example: conversation at a breakfast meeting for Christian leaders in Watford ‘If you haven’t a leader, then who’s in charge, who makes the decisions?’. Pause for thought on my part, then I reply: ‘God’. Pause for thought by other party, then: ‘well, I suppose that’s what we think too’. I think it is fair to say that my understanding of the Kingdom is a sense of something mystical, but I also feel that it could be ‘real’ – though to achieve it we have to change our lifestyles drastically, and, as an absolute minimum, ensure that everyone (everyone in the world, not everyone in Watford, or everyone in Britain) has enough to eat, adequate health care, access to education and so on. This means a lot of us having a lot less things, travel, holidays, cheap clothes, cheap, exotic food. Not an easy change to make. Justice is a huge topic, with lots of aspects, all of which could concern Quakers. I thought I’d just share an incident from my life recently that made me think about justice. My washer/drier went wrong. I did the washing and when I took the clothes out at the end of the cycle they were dripping wet. I knew something was wrong, but I put them back in, dialled ‘spin’, pressed ‘on’,and waited to see what would happen. The clothes came out damp, but not dripping ie as they should do. But I tried to spin the drum round manually and it was not moving freely. We’d had a few doubts about the machine, especially since a t-shirt had got caught between the seal and the drum and badly chewed up. It was clearly time to ask someone to look at it. We’d only had it four and a half years so it was still covered by the extended warranty we’d bought. I had to wait in the next day (aggravating since it meant missing Wednesday group, but such is life). A man came and looked at it, agreed it was faulty, probably due to something caught in the mechanisms. He couldn’t see anything through the holes in the drum, so he said he’d have to rebook us as it was a two-man split drum job to repair it. First, he’d have to ask permission to do that. The insurance company refused permission, saying it was ‘beyond economic repair’, they would contact us about a replacement. Now, here’s where the issues of justice arise. I do very nicely, financially, out of this situation. I had paid £175 to extend the warranty from two years to five years. I’ve now had two call-outs in that time, and I get a brand new replacement machine that would cost me about £500. However, much of the existing machine is now destined for landfill, though some will probably be recycled. Also, the cost of two people here to come to the house and work for, probably, less than an hour, is valued more highly than the work of how many people and how much material and how much energy to produce and ship a brand new machine. The second person is probably needed to meet health and safety requirements, rather than because it needs two people for the entire time. There is something very wrong with the sums here. We are not putting the right values on people, their time and their effort, or on raw materials, or on energy usage. I wish I knew how to put this right. In the event, we freecycled the old machine, delivering it to the person a few streets away who thought it worth trying to fix it. To someone with appropriate skills and some time, I think it probably can be fixed, and I hope it goes on to give several years of service to someone. That will go some way to redressing the balance of justice in this small incident. This is a small incident, but, to me, it illustrates some huge issues. I have been denying, ignoring and rationalising away Jesus for more than thirty years. Before I knew I was a Quaker, I tried more conventional churches. I struggled with the creeds, I struggled with the Trinity. I could cope with God, and the Holy Spirit – but Jesus, I just couldn’t get it. The teaching, the good example, yes, fine. A great teacher, let’s sit and listen. An example, yes, let’s love our neighbour. But this divinity business – I don’t think so. Then in recent years, I’ve acknowledged the need to look again. Several incidents challenged me to do this. The claim, I almost felt the accusation, that I had modelled Jesus’ love for someone – what? me? how could I have done that? A challenge from a Buddhist friend when I made a dismissive remark about Jesus. A vision of Jesus teaching by a lakeside, in a guided meditation. A Reiki attunement raised questions about healing. Did Jesus miraculously heal people? Does faith healing really work? In my head I couldn’t accept it, yet I would put my hands on someone and expect healing energy to flow. I went back to the gospels, and to the early Friends. I read, I thought, I used my intellect and my empathy. I came to see that whether Jesus was fact or fiction didn’t matter, there was a deeper truth in the gospel stories. I came to understand that the writers of these stories accepted and expected miracles. Then I went to Woodbrooke for a course about Jewish mysticism, led by Howard Cooper and Andy Stoller. In the first session I gained an insight into the use of teaching stories and a new light fell on the gospels. The text we looked at, my response to it (which seemed to me simple and childish) and the response of the group to my comments, gave me an insight into the truth of direct communication with God, what it is to be a Jewish mystic and what it is to be a Quaker. I went to epilogue, because I always go to epilogue at Woodbrooke, it is one of the things I most value about being there. Helen Rowlands spoke about the joys of saying yes. I knew then that Jesus had, in a mystic sense, been walking beside me, holding my hand as my Sunday school teacher had told me, all my life. But I had been denying it, refusing to acknowledge him. That evening, at epilogue, I said ‘yes’. In evangelical Christian language I ‘asked Jesus into my life’ – except that he was already there, I was just, finally, recognising that. I wrote this about two years ago, but the experience is still vivid to me, and when I recall it, the sense of the presence of Jesus is still vivid too. I still find it somewhat difficult to talk about, especially if my hearers feel that I am being very ‘Christian’ in my language. I’m still clear that I am a Quaker, a Universalist, and a Buddhist, but I have to acknowledge an awareness of Jesus in my life – because that is my experience. I’m going back to Woodbrooke next month to take another course with the same tutors, because learning about Judaism has opened up so much else for me. I’m not sure whether or not I hope it will be as dramatic as the above, but I’ve received some very clear promptings that I should be there. Well it always was in the children’s abecedarius! I’ve had reason to think about ink lately, especially registrar’s ink. I’ve recently been appointed Assistant registering Officer to my Area Meeting, with a view to becoming Registering Officer next year. I was lucky that this spring there was a training day and a weekend conference for Registering Officers from all over Britain. We talked a lot about ink, about the importance of using permanent ink, both on the legal documents and on the Quaker Certificate of Marriage, about the provision of pens and even how to shake the ink bottle. We also talked a lot about what it means for a couple to be married ‘in the care of the meeting’ and how this could be achieved. Often only one member of a couple is involved in the meeting, sometimes they live at a distance, occasionally a considerable distance, from the meeting where the wedding will take place. This makes it an incredible challenge for the meeting to support them and their marriage. In one session, looking at this particular issue, we were asked if any of us felt that our marriage had been, or was, in the care of the meeting – very few of us put our hands up. I was one of them. My case is somewhat unusual these days. I met my spouse at meeting, our courtship was mainly conducted at Quaker study groups (beginning by his offering me lifts) and at folk dances at the Meeting House. 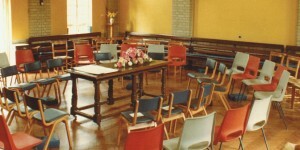 We were appointed meeting house caretakers and the wedding was arranged, at the meeting house, in scarcely more than six weeks. Like other people, we have had times of feeling out of tune with the meeting and times of being very active members, but we are still there, part of the meeting, doing what we can to support others, and receiving support ourselves. The situation isn’t always perfect, and caretaking particularly had its stresses, but I feel it is fair to say that our marriage was and is ‘in the care of the meeting’. This mixture of attention to detail (the ink) and deep concern for spiritual issues is something I really value about the Quaker way. Another reason I’ve been thinking about ink is sustainability. Our commitment, made in Canterbury in 2011, to become ‘a low carbon sustainable community’ led me to look closely at various aspects of my lifestyle, including monitoring my energy usage (and turning down the central heating thermostat), and thinking about what I buy and whether I really need things. One thing I began to notice is how many things I use that are ‘disposable’ – but as Marion McNaughton observed in ‘Finding the Prophetic Voice for our Time’ (Woodbrooke Journal Autumn 2007) ‘there is no such place as ‘away’ ‘, they go to landfill and we need to reduce how much goes to landfill. A lot of what I send to landfill is plastic, so I began to look at these disposable items. They are small items, but small items add up. One of them is ball point pens. I thought about this and remembered that how much I liked my fountain pen. I wrote all my exam scripts with it – O level, A level, degree. I’ve fetched it out, and am trying to use it (usually with washable ink for everyday use) instead of ball points. I’m also using pencils more, for writing all the lists that I constantly use in an attempt to bring some order to my life! This is a small thing, but again we need the attention to small details combined with an awareness of the bigger picture.